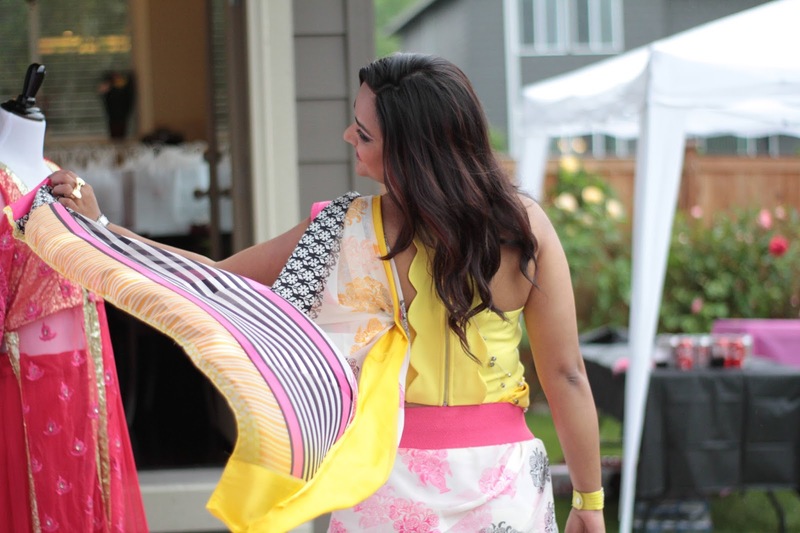 If you thought Indian Saree was not a good option for a cocktail party, think again ! I absolutely love ethnic fashion and love this phase we are in right now where the whole world is trying to adapt to fusion fashion. 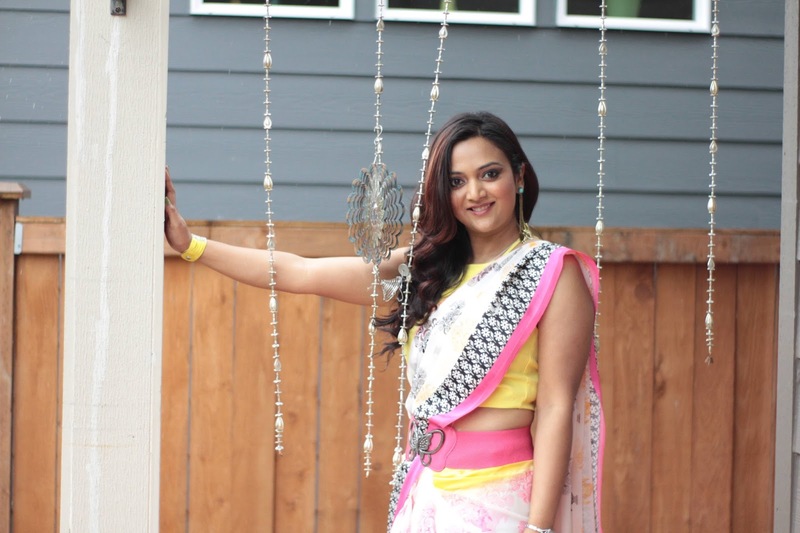 Fashion to me is to be able to express myself so more than often at parties and events you will spot with wearing ethnic clothes styled to my personality. 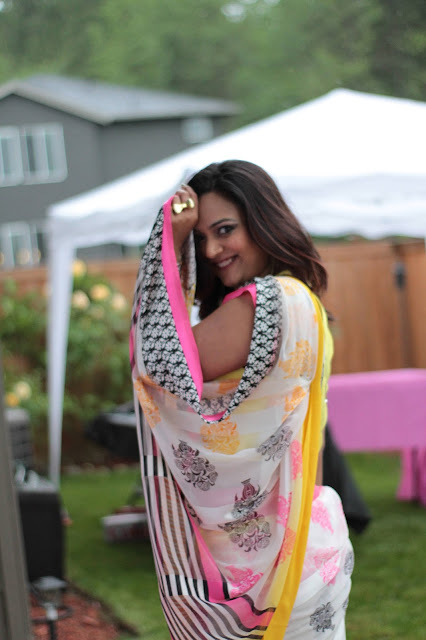 For me Saree is the most versatile piece in my wardrobe. 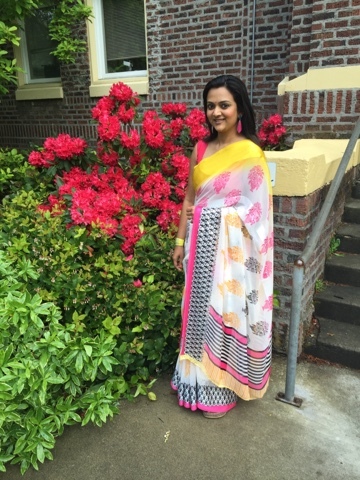 I can wear sarees to the most traditional functions and festivals and also to cocktail parties. 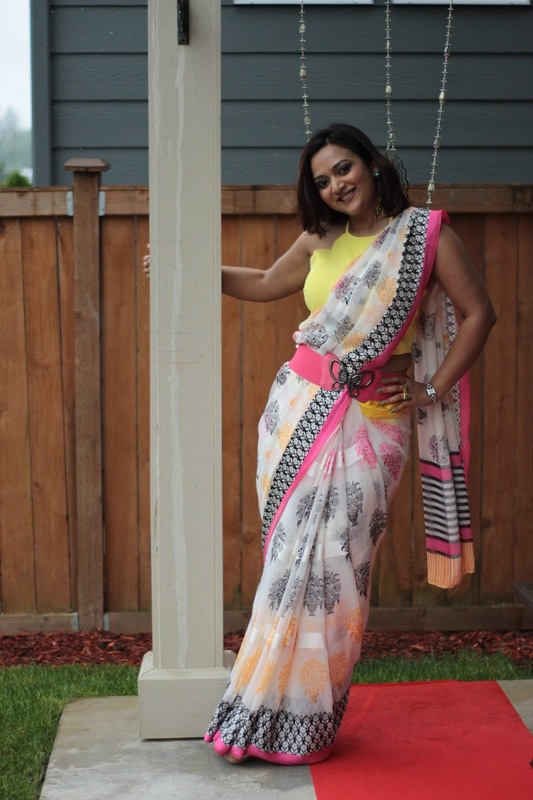 Saree could be dressed down or accessorized up to suit your personal style and occasion. 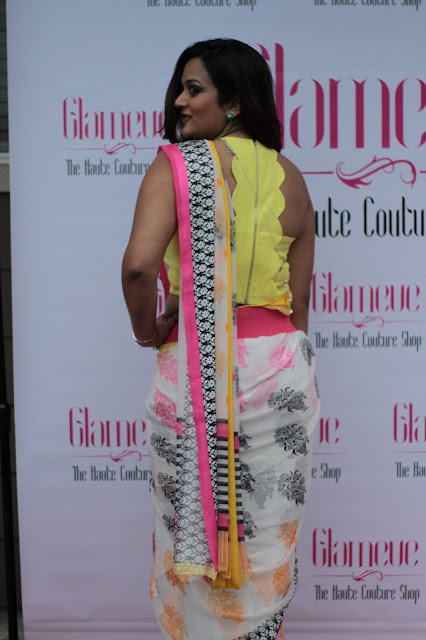 This chiffon light weight beauty which truly represents spring colors is the latest collection from Glameve Fashion. Its a boutique store, which specializes in custom made outfits and they ship all over USA, Canada and India. In addition to designer wear they also have a wide range of ready to ship items ranging from Sarees, gowns, lehenghas and accessories. They also provide consulting services and custom design options to individual customers so if you have any queries fell free to email them at support@ glameve.com. As you can see its colorful yet subtle so gives you ample space for accessorizing without looking overly dressed. I love such pieces which can be dressed up for a casual occasion too. For me buying something which cannot be worn multiple times is a dead investment. 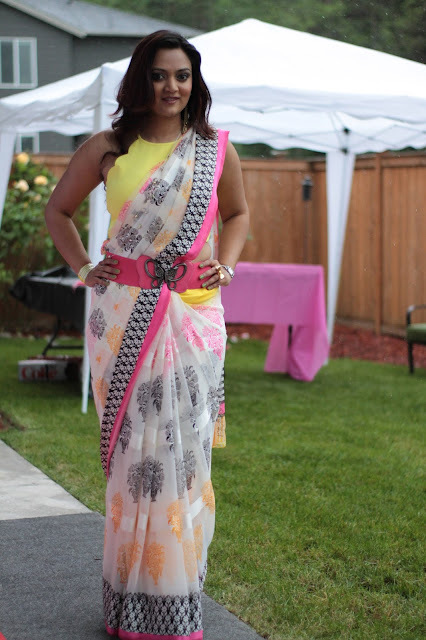 So here's how I wore Glameve's Saree for a traditional event. And just after two weeks I wanted to wear it again but this time wanted to give it an modern look. So for the Glameve Soriee - Wine n Cheese event (details of which will be shared in next post) I chose to wear the same saree. 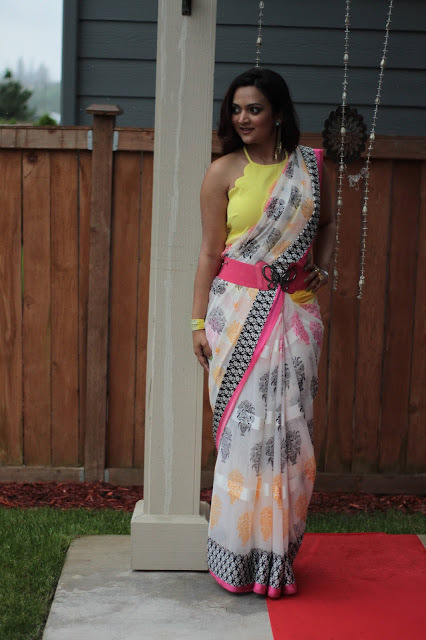 Yes for most of us Saree might not be a good option for a cocktail party, but I hope this post will make you think differently. 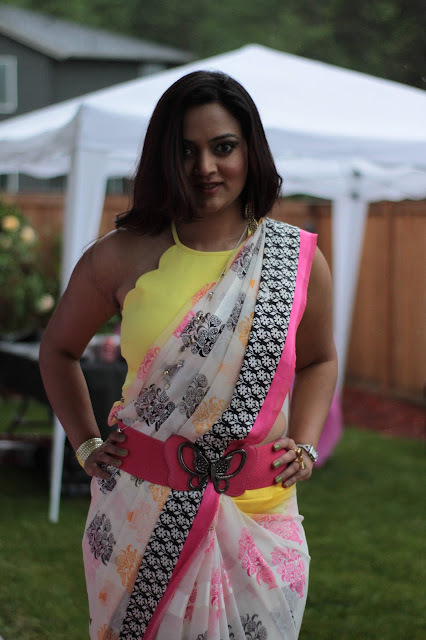 So I styled the saree with a trendy crop top with cut out details at the shoulder instead of the conventional blouse. Right accessories is the key to this look. 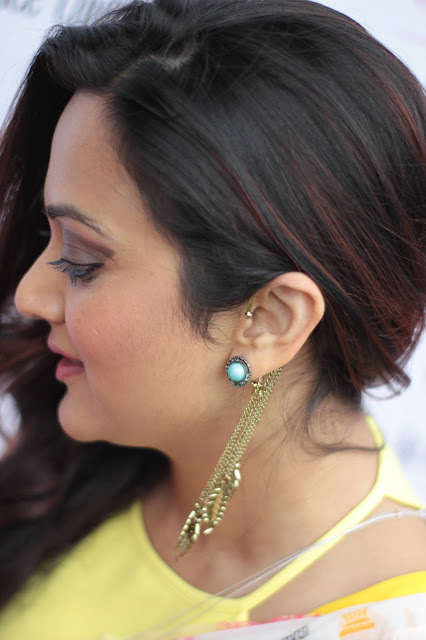 So I wore ear cuffs and yellow leather bracelet to add a certain amount of edginess. The highlight of the look is the pretty pink belt which is the right pop of color to brighten the outfit. Also the addition of belt makes it look unconventional and if you are a curvy girl like me, it helps you define your curves. I am wearing a regular long necklace just across my body to provide more detailing. 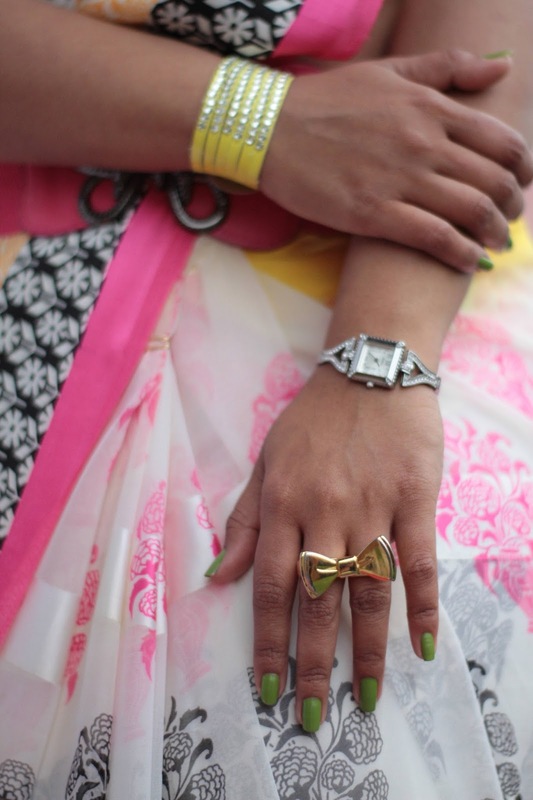 I threw in my favorite golden bow ring and the comfortable white wedges from Amiclub wear are perfectly blending in. The most important point to remember is "When you are using too many colors, use them in limited quantities and don't over do them". Choose one of the main colors (like for me it was pink) and wear two or more accessories in same shade (my pink belt and pink bag). Choose colors and shades which are already present in your outfit. Choosing shades different from your outfit might result in an unpleasant extremely colorful outfit, which we might wanna avoid. 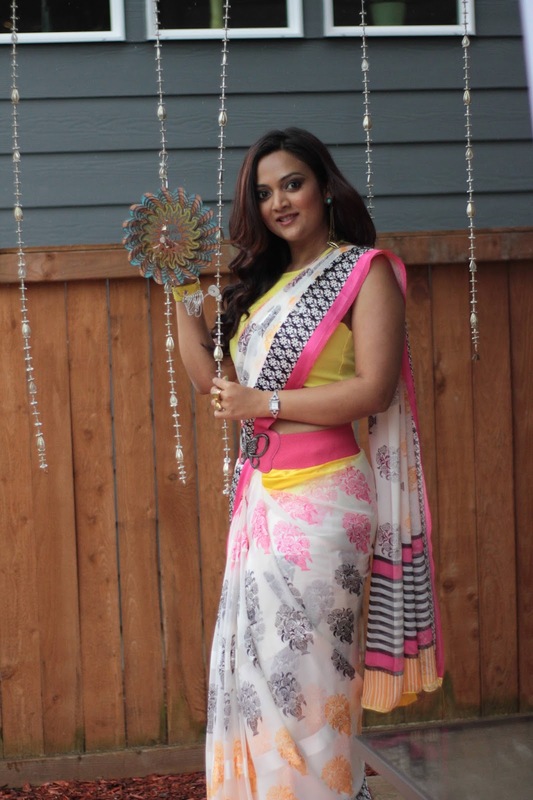 Check out their gorgeous saree collection here. Please let me know your thoughts and share a pictures with me on Facebook if you tried this look on! Really love this color scheme on you! You look lovely. I especially like the blouse! Wow, the outfit looks beautiful and full of personality, you totally rock it. 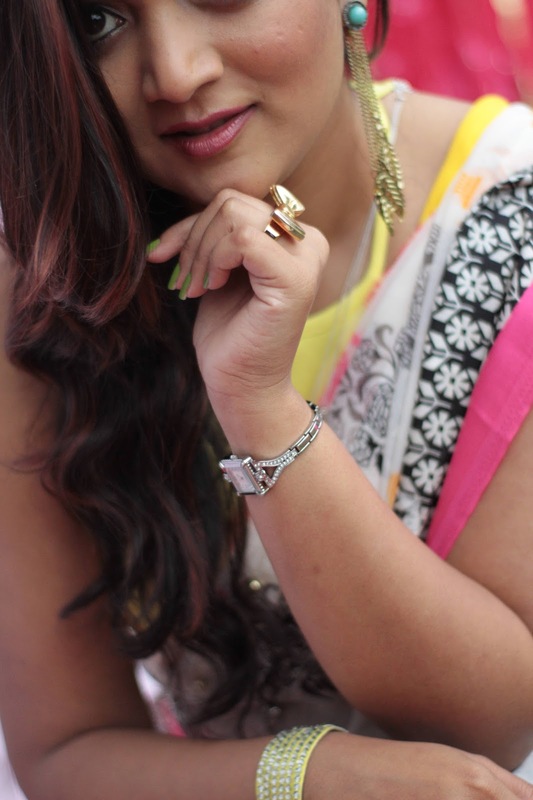 I loved it how you styled this simple saree with right accessories. Beautiful Ananya and I had so much fun at glam eve..hope to see you soon! 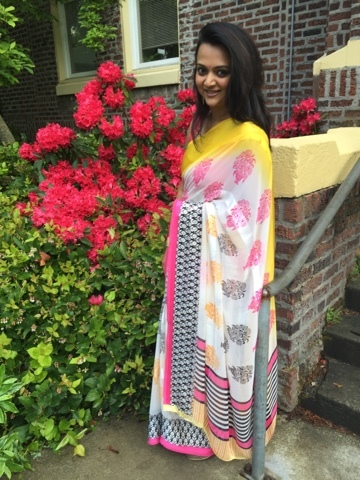 The saree is beautiful! 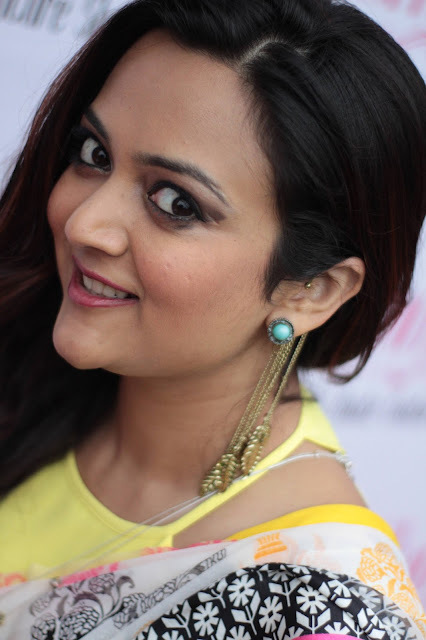 And you look gorgeous :) Love the yellow blouse. 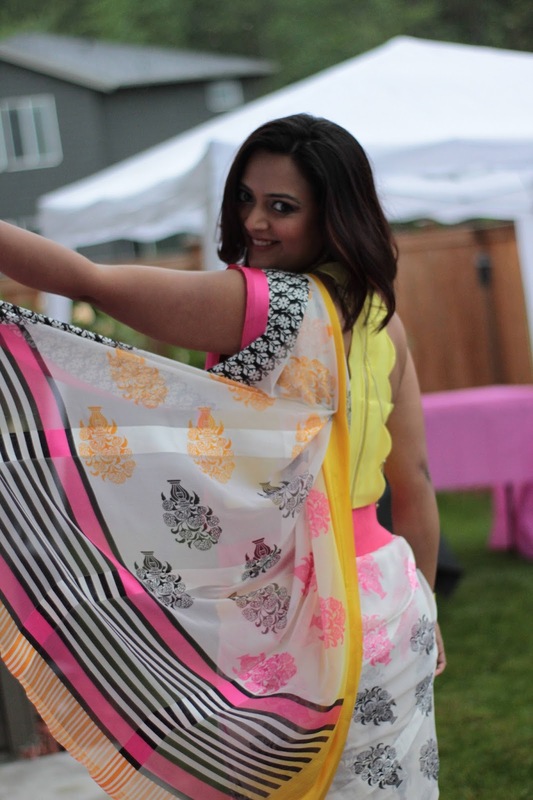 This saree is killer . And u look beyound pretty No one rocks it the way u do . You are so beautiful. I just love your dress and jewelry. Such amazing styling.